1st Review of the NEW Ironman Lanzarote Bike course. The NEW IM Lanzarote course has finally been revealed in the last 24 hours and we love it! While the course has been a well-kept secret, our sources were able to reveal the course to us in March and we took the opportunity to ride the course, recently. The are lots of questions to be asked and to be answered and here’s our take on the new course. It’s a great IM course, arguably better than previous courses. While there is a similar amount of elevation, the course lends itself better to a higher number of participants making the time cuts. The first main difference is where the course went from the El Toro roundabout to Uga via Puerto Calero. It now goes up behind the El Toro restaurant towards Tias, through Conil and onto the LZ 30, turning left to go down through La Geria to Uga (Camel Roundabout). 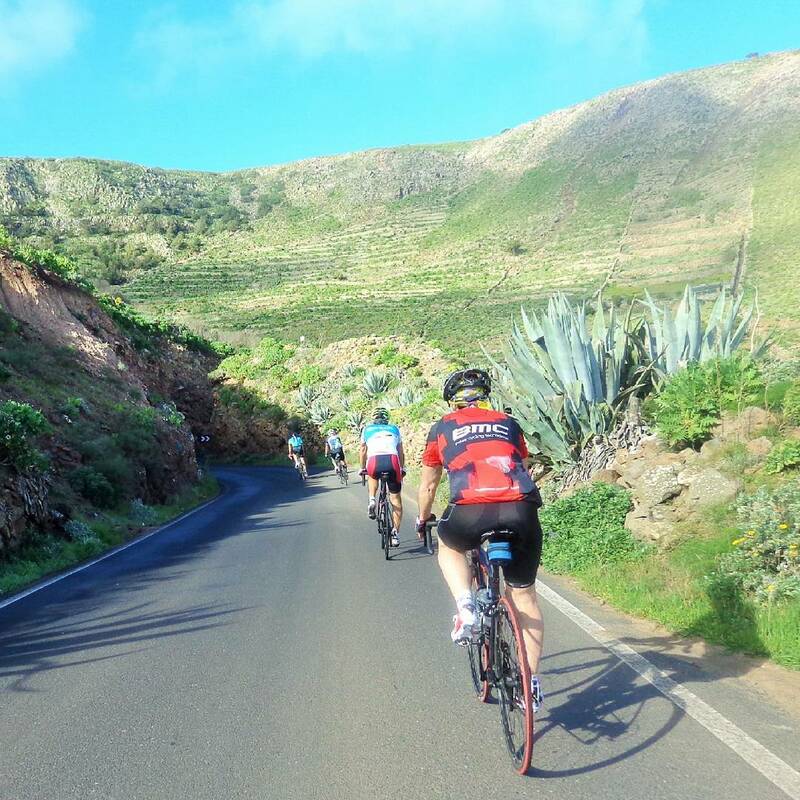 The course rejoins the old course for a lap of El Golfo and proceeds up through Timanfaya and the National Park to Mancha Blanca. This is where the new course changes again. The loop that takes in Tiagua, back to Tinajo, down to La Santa, Soo and Famara has been completely omitted. Turn right in Mancha Blanca to ride the “planet of the apes” road LZ-56 all the way to the LZ-30. Turn left onto the LZ-30 going all the way to Teguise, back on the old course again and all the way to Mirador del Rio. The course continues back through Mala and Guatiza to the next (most welcome) change. Tahiche and the horrible Nazaret LZ-408 have been omitted. Instead, you turn right onto the LZ-404 for Teseguite and Teguise. As you leave Teguise on the LZ-30, you will turn for Famara on the LZ-402. Here the route designers have added what we think is the “pièce de résistance”! The new “down and back” to Famara on the LZ-402 is a fabulous addition, Las Laderas to be precise. Riders will have almost 140km in the legs. On paper, it’s a nice downhill to Famara, in reality, and assuming the wind blows North Easterly, this is going to snap a lot of legs. The draggy climb back up is only slightly softened by the very fact you will most lightly have a tailwind. The fact that any participants within 25-30 minutes of each other are likely to see each other on this section spices things up a little more. Get back up to the roundabout and travel back down the LZ-30 to where the beginning of the course came out from the LZ-501 to the El Toro roundabout via Conil and the “donkey track”. The highlights, without doubt, are the new additions. The route from El Toro to the LZ-30 via the “donkey track” and Conil is a climbers paradise. 295m altitude in Conil and only just over 15km in to the course. A few over-eager riders are going to blow up here. Also, the “down and back” to Famara. This will make or break riders, mental strength will play a big part for the athletes! Overall, it’s a better-designed route and still as testing as the old course. Visually it’s even more amazing and the road surface is much better than before. Do we expect a course record? Well, it’s a new course so there will be a record but we expect the time to be marginally quicker on the new course. Please note, the map graphic and the detail below have been sourced from the official IM Lanzarote website. This is a RECON of the 1st 107km for the IM Lanzarote Bike Leg. On the day of the event, the cut off time is 2.30pm at the 107km point. Correct knowledge of the course will save you between 12 and 40 minutes on the bike leg! Are you concerned about missing this cut-off….don’t miss this! – Strong sportif riders are also welcome to join. – We will show you the “sweet spots”, where to push on and save time….there is 12 of them in total! Last year, one of our recon riders got inside every cut-off by 6 to 15 minutes. He made it because he knew he could! The infamously windy 2015 Ironman, all our recon participants bettered their estimated bike times when most missed theirs by half an hour…..there was an unusual North, North West wind on the day! It’s the only FAT bike tour in Lanzarote! Distance 20km, 90% off-road and 50% beach, taking in some of the most spectacular coastline on the island. The route is suitable for all levels of cyclist, from the MTB enthusiast to the commuter cyclist.